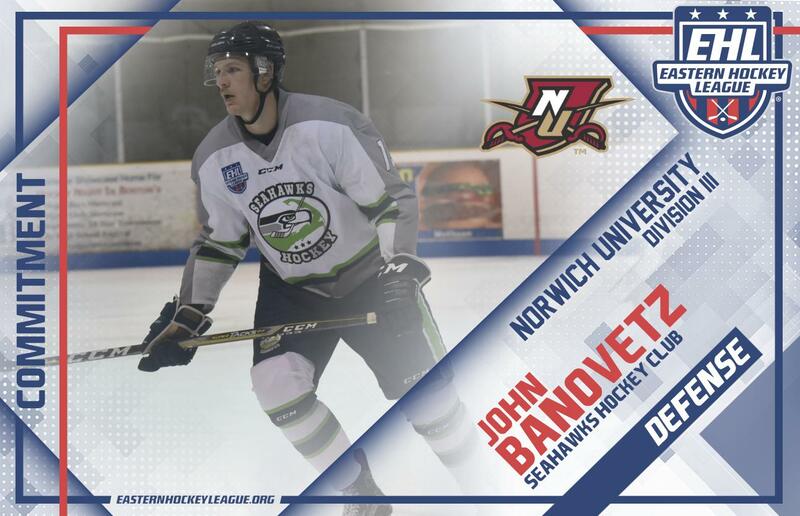 DENNIS, MA -- John Banovetz, a defenseman for the Seahawks Hockey Club, has committed to Norwich University for the fall of 2019. The EHL All-Star is in his second season with the Seahawks, and to date, he's tallied 36 points in 75 career games in the Eastern Hockey League (EHL). "Norwich is a perennial powerhouse in college hockey and John will be a great fit for them, both on and off the ice. We are excited for John and his family to have earned this opportunity," said Seahawks head coach and general manager Bill Zaniboni. As Zaniboni mentioned, the Cadet hockey program is well-known as one of best at the Division III level. Along with Banovetz, Norwich is also bringing in Niks Krollis of the New Hampshire Avalanche, as the fellow EHL All-Star made the same decision back in November. "I am excited to announce that I will be continuing my hockey career and furthering my education at Norwich University," said Banovetz. "I would like to thank my parents for the continued support through junior hockey, as well as my teammates, both past and present. I would also like to thank Coach Zaniboni, Coach Greene, and the Seahawks Organization for giving me the best opportunity to advance and play college hockey." Banovetz and the Seahawks are in a tight battle for a First Round bye in the New England Conference, as they get back back to work tomorrow against the Connecticut Chiefs at 12:30pm.